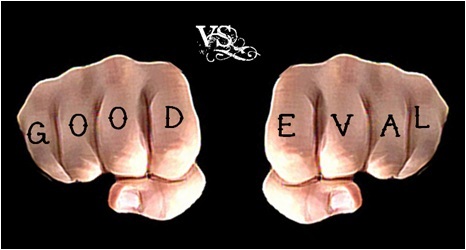 After another blogging hiatus, the battle between good and eval continues. Or at least my blog is coming back online as the American Evaluation Association’s Annual Conference in San Antonio (November 10-14) quickly approaches. I remember that twenty years ago evaluation was widely considered the enemy of good because it took resources away from service delivery. Now evaluation is widely considered an essential part of service delivery, but the debate over what constitutes a good program and a good evaluation continues. I will be joining the fray when I make a presentation as part of a session entitled Improving Evaluation Quality by Improving Program Quality: A Theory-Based/Theory-Driven Perspective (Saturday, November 13, 10:00 AM, Session Number 742). My presentation is entitled The Expanding Profession: Program Evaluators as Program Designers, and I will discuss how program evaluators are increasingly being called upon to help design the programs they evaluate, and why that benefits program staff, stakeholders, and evaluators. Stewart Donaldson is my co presenter (The Relationship between Program Design and Evaluation), and our discussants are Michael Scriven, David Fetterman, and Charles Gasper. If you know these names, you know to expect a “lively” (OK, heated) discussion. If you are an evaluator in California, Oregon, Washington, New Mexico, Hawaii, any other place west of the Mississippi, or anywhere that is west of anything, be sure to attend the West Coast Evaluators Reception Thursday, November 11, 9:00 pm at the Zuni Grill (223 Losoya Street, San Antonio, TX 78205) co-sponsored by San Francisco Bay Area Evaluators and Claremont Graduate University. It is a conference tradition and a great way to network with colleagues. More from San Antonio next week! I am Moein from east! And say have a good presentation! With greatest panelists.